We are supported by our sophisticated and state of art infrastructure unit. We procure best quality raw material to manufacture our products from the trusted and reliable vendors of the market. We have installed latest machines and equipments for the manufacturing of offerings as per the ongoing market trends and developments. To achieve our set organizational goals and objectives, we have appointed a team of well qualified and talented professionals which are selected on the basis of their previous working experiences and skills. Our professionals are working as a team to achieve desired outcome. The close coordination with each other of our employees ensures hassle free and output oriented working environment. With the help of our mentor Mr. Nilesh Shah, we are growing constantly in this domain. Due to his vast experience in this industry and ability to handle critical situation, we are able to develop a broad client base. 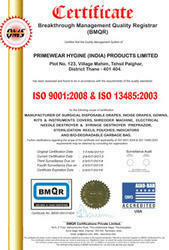 Manufacturing, Trading, Importer and Exporter of Surgical Drapes. We have become one of the renowned suppliers of a range of surgical disposables to various medical colleges and hospitals across the country. Our quality products available at industry leading prices have won us many accolades from our distinguished clients. Our company manufactures an assortment of surgical and medical disposable supplies such as Major Drapes, Disposable Drapes, Leg U Drapes, Squirrel Drapes, Craniotomy Drapes, Ophthalmic, General Surgery, Cardiovascular / Cardiac, Orthopedic, Kits, Gowns and Equipment Covers. Because of their quality, our products have become highly popular in the medical fraternity across the globe. These disposable products are made up of medical grade and strong polyethylene films. These and other raw materials used by us are procured from reliable vendors form across the country. Each lot of the sourced materials is tested before sending out for production. Our products are also widely used for protection in surgeries and in case of contagious diseases. Having made a mark for ourselves in the domestic markets we are now on the verge of expanding our market presence targeting the bigger Asian and European markets. To realize these efforts we have plans to set up our offices in foreign lands. This will help in increasing our market presence and thereby aid in marketing our products to a larger market sphere. We assure our valued clients across the nation that we are a best resource to avail a best quality spectrum of surgical drapes as per their precise requirements and needs. We manufacture these products by taking optimum quality material. Being a quality centric organization of this domain, we offer all our products after inspecting them on diverse quality parameters as per the industry defined procedures. Apart from this, we are able to deliver the bulk demands of our offering within the requested period of time.